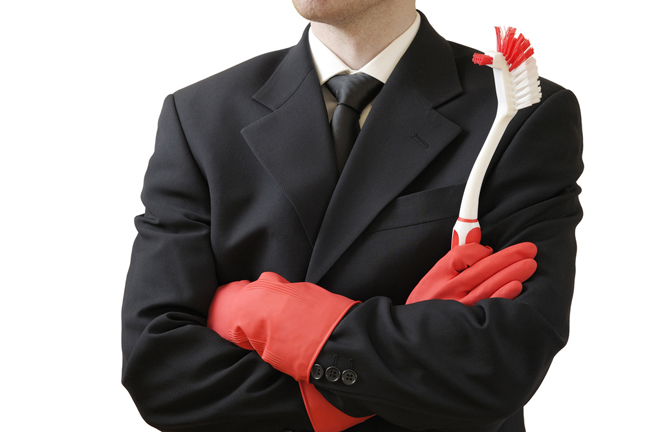 Get motivated for the janitorial aspect of your job by realizing it is part of your marketing. How you appear to your customers, vendors and business peers has a lot to do with building a business reputation. If you appear cluttered, dirty and disorganized, it could send a message that will take a lot of energy to erase. 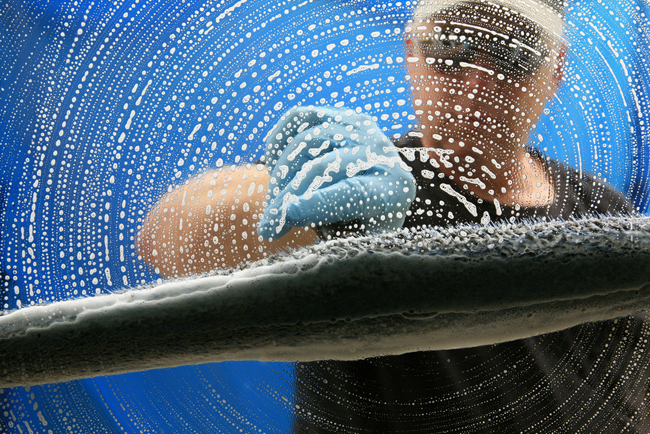 Help keep your business looking ship-shape by making regular cleaning a habit. That way, you won’t ever let it get to the point where customers can see you need to mop the floors or wipe down the bathroom. Set up a routine that includes daily tasks such as taking out the trash, giving the bathroom a quick wipe and running the vacuum. Incorporating this routine at either the start or end of your day can make a big difference in the overall cleanliness of your office. Choose a day of the week to handle once-a-week items such as dusting or cleaning the office kitchen. Note on your calendar anything you need to outsource, such as carpet cleaning, so that it gets taken care of at regular intervals. When building or repairing something, having the right tool is essential to doing a good job. The same goes for cleaning. Making do with this or that can create extra work. The right tool will allow you to do a thorough job the first time and make tasks easier. Tackling Dust: Trap dust with a microfiber cleaning rag or duster. Instead of just circulating dust back into the air, the dust sticks to the cloth. They can also be tossed in the wash and used again. Polishing: Only use furniture polish spray on real wood furniture. Using it on other furniture surfaces makes them slippery and streaked. Cleaning Glass: Use a good-quality glass cleaner for glass tabletops and mirrors that won’t streak. Choose a cloth that doesn’t leave lint behind. Disinfecting: Disinfectant wipes are great for a quick daily clean of kitchen or bathroom surfaces. 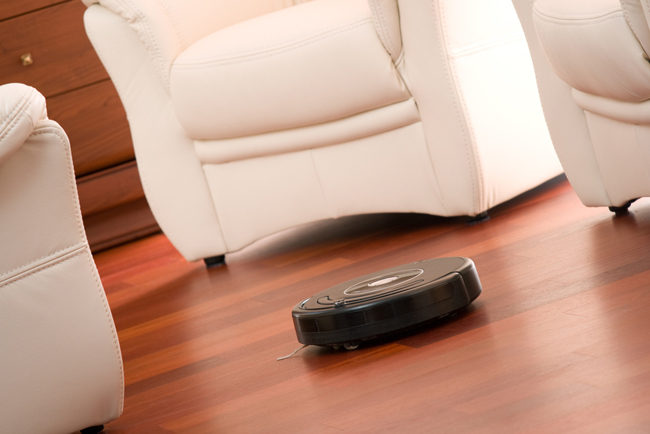 Vacuuming: Get a good-quality vacuum, as keeping the floor clean is essential and you will use it daily. Or, save time and energy by using a robot vacuum. You can set it to clean each night while you are gone and it will hook itself back to the charger when it is finished. This way, you’ll have clean floors every morning. Tackle cleaning like you would any other task—with project management. Set both standards and a checklist. It’s easy to forget things like cleaning exterior windows or wiping accumulated dust from ceiling fans. Create a checklist for your daily tasks and another for those that need to be done weekly. Using the checklist is a great way to build a routine. It always takes repetition to create a good habit. A checklist also comes in handy as you grow and can delegate these tasks as it sets standards for what you expect to be done. Don’t be afraid to get an outside opinion. Ask a friend or family member to take a close look and tell you if there is anything you are missing and if the appearance you offer is the appearance you want to project. Helping businesses stay organized while growing is a mantra of professional organizing expert Lea Schneider. Lea owns her own business and has worked for many others, and she now writes her tips for The Home Depot. If you are researching vacuum cleaners or other cleaning devices referred to by Lea, you can review a selection here. Lea Schneider is a home-office organizational and productivity expert who has advised business clients for many years. Lea’s tips on using storage to help solve disorganization issues stems from many engagements with her clients. For storage ideas for your own office, you can research solutions on the Home Depot website.